Paris at Night is beautiful. We've had the privilege of visiting Paris a half a dozen times and we never tire of enjoying its beauty. So we had to share its beauty with you too! 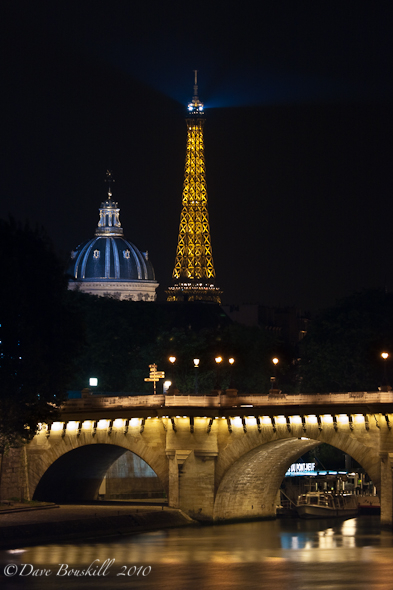 It's known as the city of lights and Paris doesn't disappoint. 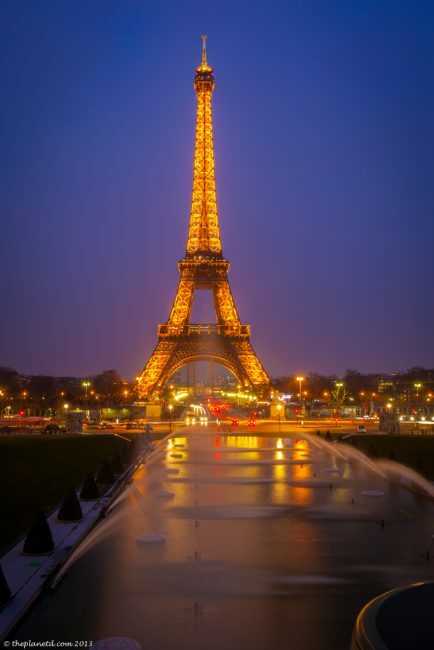 If there is one city worth strolling through once the sun goes down, Paris is it! Monuments, towers, and museums are lit up. Traffic even turns into a work of art. 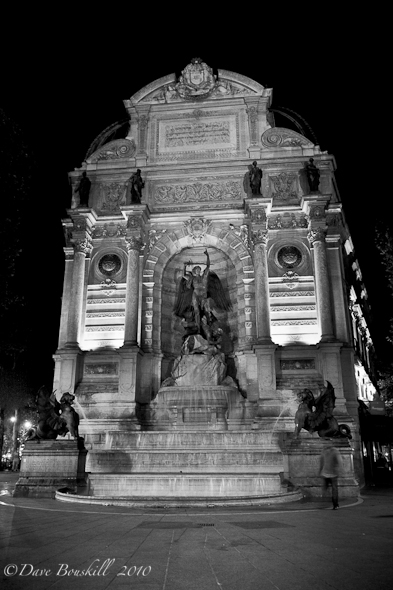 We went through Paris taking photographs of the city at night and here are some of our favourite shots from our time exploring Paris at night. A word of warning, they turn all of the lights off on the monuments and bridges of Paris at Midnight but that gives you plenty of time to still see it all. Better yet, if you have a few days, you won't miss a thing! 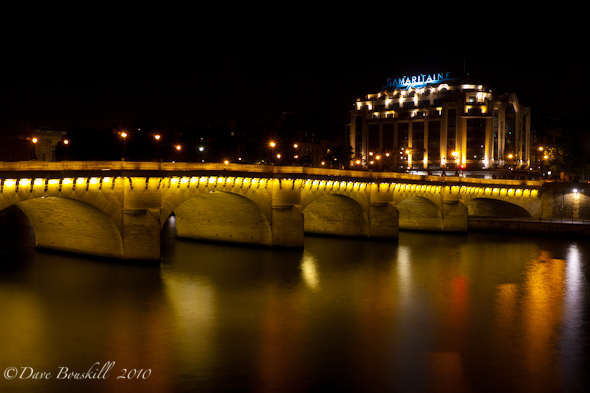 Below are some photo's that I made of Notre Dame, The Latin Quarter, The Pont Neuf and the Eiffel Tower. 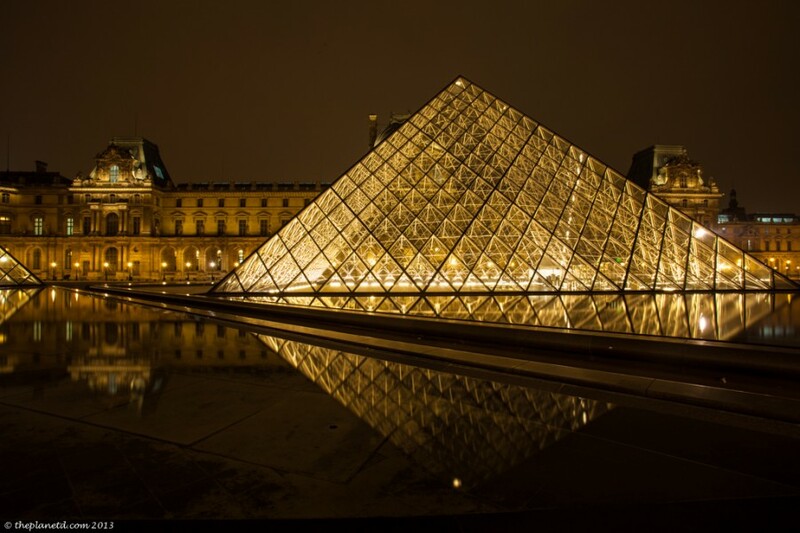 The Louvre is busy during the day, but at night nobody is there. The glass pyramid by IM Pei is a work of art unto itself and it is far more beautiful to see in the evening than during the day. Another great place to visit at night is Montmartre. See our tour of the neighbourhood here. 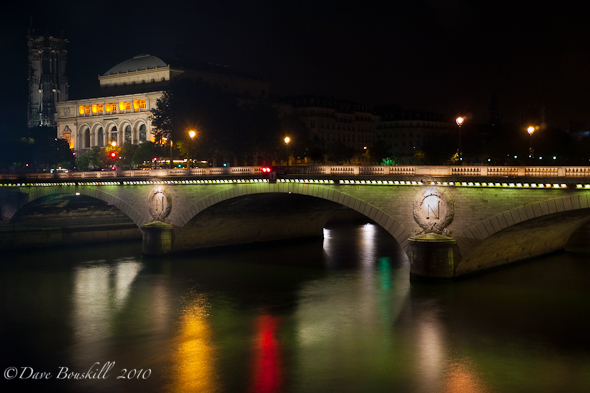 Photos to inspire people to get out of the bars or out of their hotel rooms and explore this beautiful city at night. 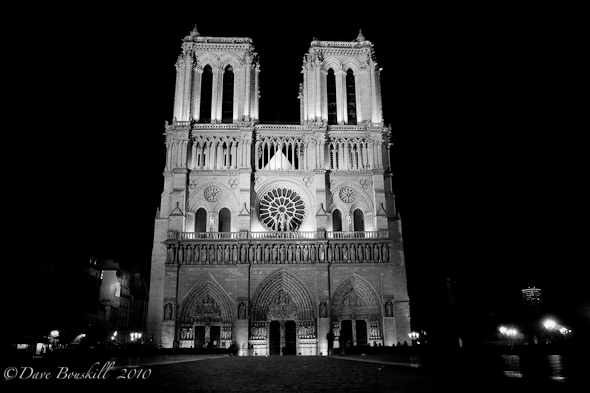 Notre Dame is one of the most famous attractions in Paris and lucky for us, they light it up at night! Want a spooky experience in Paris. Visit the Catacombs. The Eiffel Tower stands over Les Invalides. The resting place of Napoleon. 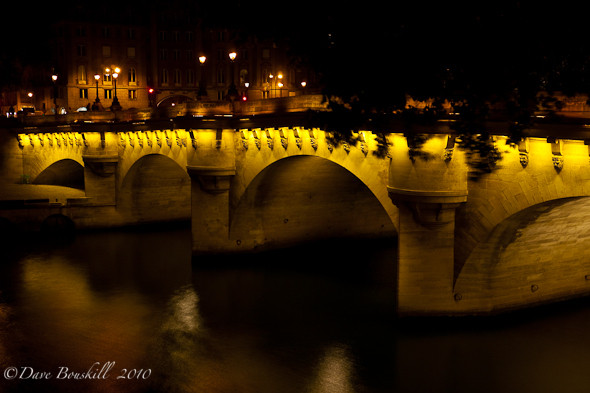 The famous Pont Neuf Bridge is lit up at night in Paris. 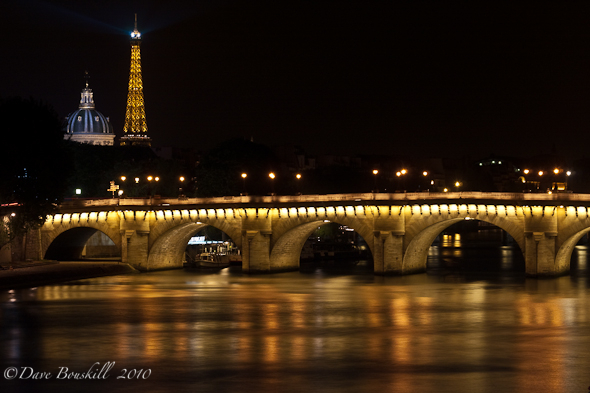 Walking along the River Seine at night lets you see all of the great attractions of Paris. 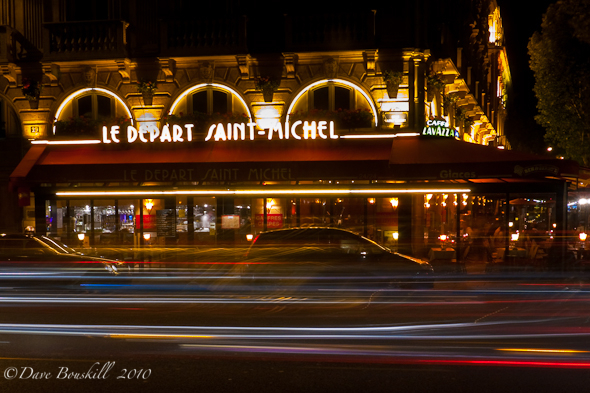 The Latin Quarter is rockin' at night and even though its known for nightlife, it's also beautifully lit at night. Have you been to Paris. Did you make sure to go out at night? What Paris at night photo would you like to see added? 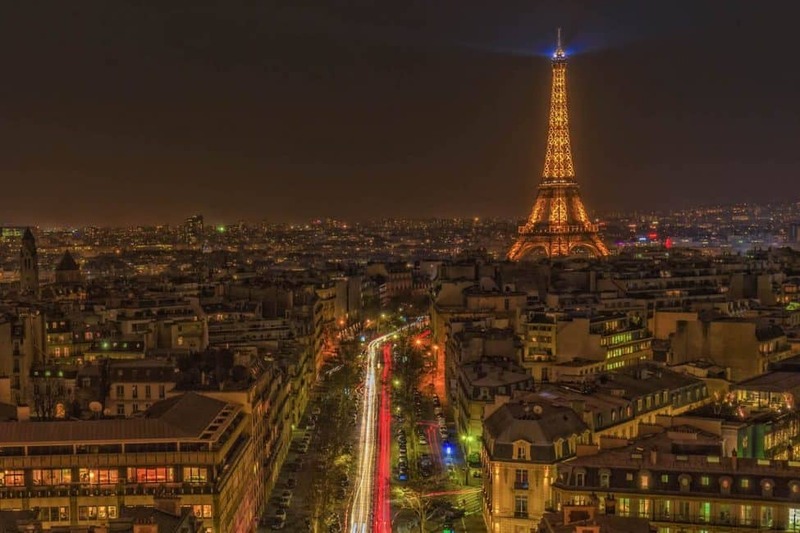 21 Responses to "Paris at night – An Incredible Journey in Photos"
These are stunning photographs-I haven’t been to Paris in almost 10 years, but your photos are a reminder to how much I loved the city! Do you have any around the Moulin Rouge? Would love to see how you captured that icon! We didn’t really take any of the Moulin Rouge at night. We just grabbed some daytime photos of it. But we’ll have to go back to take some, that strip would be amazing to photograph. .-= cynthia in France´s last blog ..Videos of France’s Bastille Day Celebrations as celebrated in the French Alps =-. Thanks for letting us know about the phostos Cynthia! I have no idea what happened to the Paris photos, but we are on it! Gorgeous pics! Especially of the Notre Dame…it’s one of my favorite buildings in the world. When I was there last, at night the Eiffel Tower was lit up a sparkly bright blue, though I’m not sure if it was like that for a special event or not. .-= Emily @ Maiden Voyage´s last blog ..Approach Guides Offer Cultural Travel Insight =-. Hi Emily. That would have been cool to see the Eiffel Tower blue. For 5 minutes at midnight they changed the lighting to sparkling silver, but we didn’t have time to set the camera up and take a great shot. Too bad. I really like the colors, reflections, and textures in the water at night. That picture of Notre Dame is also beautiful! .-= Migration Mark´s last blog ..Climbing Mount Kinabalu in Sabah, Borneo, Malaysia =-. Thanks Mark! We couldn’t believe our luck when we actually managed to get a picture with out people in it at Notre Dame. Even late into the night, people are everywhere in Paris. Dave loves taking night shots. We wish that he took more in Paris, but it gets dark so late and when we first arrived we couldn’t stay awake past 10:00! My last time in France we spent 3 weeks exploring along the southern coast and some of the interior, but only 3 days in Paris – we crammed so much sightseeing into those 3 short days that I must admit I was too tired to take much notice of how beautiful Paris is at night – THANK YOU for these stunning photos to remind me that I really must get back and spend more time there! .-= Trisha Miller´s last blog ..NEW Feature at TWE: Under The Microscope =-. I understand completely Trisha. It is so difficult to stay up later and really enjoy Paris at night. We are looking forward to going back one day and making it to the Champs Elyse at night. Our first three days there we couldn’t stay up past 10 and then we only had 2 nights when we got back. One night it rained heavily, so we were forced to take all our shots in one evening. Would have loved more! Wow, lovely photos! I can’t wait to see this in person! .-= Gray´s last blog ..The Art of Solo Travel, A Review =-. Thanks Gray. I can’t wait for you to see it in person as well. Paris is a place that has to be seen. Dave! OUTSTANDING!!!! I have fallen IN LOVE with my city all over again. unchanging beauty of Paris, that is forever. Thanks MaryLouise, we made a point of going to Marie Antoinettes Prison. We only got a couple of shots off before they turned out the lights. But we managed (or should I say Dave managed) to get a few off in time. .-= Andy Hayes | Sharing Travel Experiences´s last blog ..Flying with MJ =-. Thanks Andy. We didn’t quite cover all the ground, but we tried our best. so many places that we missed. Like the view point from the Arc Du Triomph. The metro closes awfully early as well, so it is difficult to stay out for too long.